Background and Aim: Patients with warm autoimmune hemolytic anemia (AIHA) may carry immunoglobulin (Ig) M antibodies that react at room temperature and are nonpathological, but few may have cold agglutinins that react at or above 30°C and are referred to as “mixed” AIHA (MAIHA). Here, we present our experience on characterizing MAIHA both clinically and serologically. Materials and Methods: Out of 134 AIHA patients, 13 diagnosed as MAIHA were subjected to detailed immunohematological characterization. Most patients were severely anemic and required urgent transfusions. Resolution of blood group discrepancy, elution, Donath-Landsteiner test, and adsorption study were performed following established protocol. “Best match” blood units were selected and transfused to patients. Results: Eight of the 13 patients had severe hemolysis. The median age of patient was 37 years with a female preponderance and secondary MAIHA was observed in 8 (61.5%) patients. Blood group discrepancy was encountered in 4 (30.8%) patients. Multiple red cell bound autoantibodies and high titer serum-free IgM autoantibodies were detected in all samples. Twenty-nine units of “best match” packed red blood cells were transfused to 12 patients without any adverse reaction. Improvement in hematological and biochemical values was observed in all follow-up patients. Conclusion: Patients with MAIHA often present with severe hemolysis necessitating blood transfusions. While red cells are coated with multiple autoantibodies, both warm reactive IgG and cold reactive IgM autoantibodies are present in the serum. These serological complexities not only render a crossmatch incompatibility but often lead to blood group discrepancy. “Best match” blood transfusion is always lifesaving. Background: Plantar fasciitis (PF) a common chronic musculoskeletal pain routinely diagnosed and treated in rehabilitation practices. When conservative management fails in this degenerative disease, local injections of corticosteroids, platelet rich plasma (PRP), botulinum toxin, extracorporeal shockwave therapy, surgical release are used. In our prospective randomized pilot study we compared the regenerative efficacy of Platelet Rich Plasma vs Kinesiotaping with phonophoresis who were resistant to conservative management of PF. Materials and Methods: Sixty-four chronic plantar fasciitis patients nonresponding to conservative management were evaluated for two interventions.36 patients received ultrasound guided 2.5 ml autologous platelet rich plasma (PRP) injection and 28 participant received phonophoresis and total10 Kinesiotaping on alternate days. 54 participants 33 in PRP intervention group and 21 in KT group were analyzed, by Numerical Rating Scale (NRS), plantar fascia thickness (ultrasound guided) and disability and activity limitation measured by foot function index in every two weeks up to 6 months. Results: Post intervention assessment at 2 weeks revealed improvement in pain relief was better in Kinesiotaping group (NRS-4.619) as compared to PRP group (NRS- 6.061). But evaluation at 12 and 24 weeks showed statistically significant improvement in NRS and Foot function index in PRP group than in Kinesiotaping. Similarly, at the end of 24-week improvement in foot function index (FFI) was more in PRP group (P<0.0001). At end of 12 and 24 weeks there was significant reduction in plantar fascia thickness in PRP group (p<0.0001) as compared to KT group (p<0.05). Conclusion: Our study concluded that therapeutic quality autologous PRP injection (1x106 platelets/μl) has regenerative effect with long and better efficacy in pain management of chronic recalcitrant plantar fasciitis than Phonophoresis and Kinesiotaping. Introduction: One of the most common blood-borne transfusion-transmitted diseases is hepatitis C. Patients with a history of multiple blood transfusions are significantly at a greater risk of infection by contaminated blood and blood products. Beta thalassemia major is one such condition where repeated blood transfusions are required for patient management. Materials and Methods: The present study was conducted to investigate the serological prevalence of hepatitis C virus (HCV), its viremia, and genotype distribution with clinical parameters among multitransfused thalassemic individuals. In this study, a total of 300 patients were screened to detect anti-HCV antibody in serum, along with liver function parameters and genotyping. Results: Seventy-five (25%) patients were found to be HCV positive by enzyme-linked immunosorbent assay (ELISA). Among them, 49 (65%) were HCV RNA positive having a significant viral load in their blood and rest 26 (35%) were below detection level, which signify auto clearance of the virus in those patients. According to our study, HCV genotype 3 was the major circulating strain (92.59%) followed by genotype 1. Liver enzymes, such as alanine aminotransferase, aspartate aminotransferase, and total bilirubin, were significantly elevated among HCV seroreactive individuals. 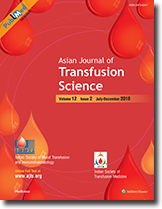 Conclusions: This study clearly indicates that the incidence of transfusion-transmitted hepatitis C is high in thalassemia patients, but actual scenario of HCV viremia can only be found by HCV RNA qualitative and quantitative detection method and not by ELISA, is a major concern for this high-risk group of population. Background and Objective: Controlled-rate freezing is a complicated, expensive, and time-consuming procedure. Therefore, there is a growing interest in uncontrolled-rate freezing (UCF) with −80°C mechanical freezers for cryopreservation of hematopoietic stem cells. 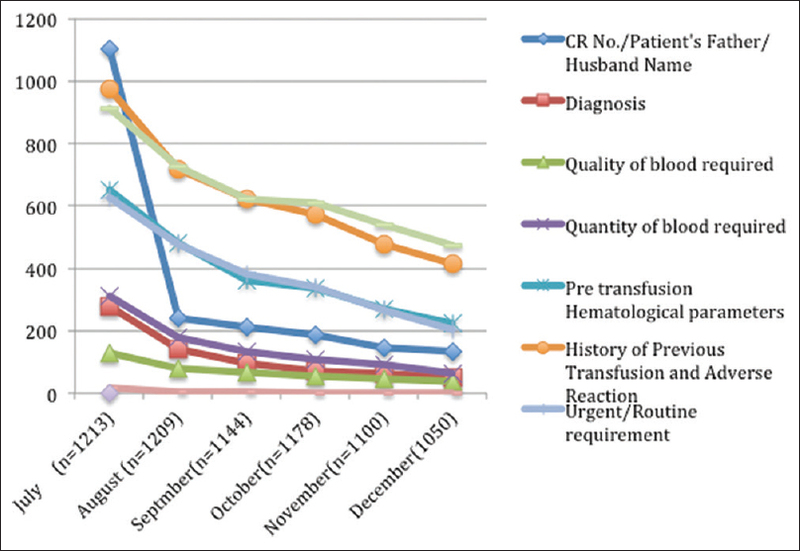 This is a retrospective analysis of efficiency of UCF and outcome of autologous peripheral hematopoietic stem cell (PBSC) transplants at our center from December 2011 to June 2016. Materials and Methods: Cryoprotectant solutions used included 5% dimethyl sulfoxide and 5% albumin with 2% hydroxyethyl starch and stored at −80°C mechanical freezer till transplant. Evaluation of cryopreservation was studied by analyzing the variation in cellularity, viability, and CD34+ stem cell dose recovery as well as clinical follow-up with engraftment. Results: A total of 51 patients (23 females and 28 males) underwent autologous PBSC transplantations with a median age of 31 years (range: 3–60 years) for both hematological and nonhematological indications. Mean recovery post by UCF at −80°C mechanical was 92.9% ± 15.5% for nucleated cells, 86.6% ± 15.5% for viability, and 80% ± 21.5% in CD34+ dose. The median day to neutrophil engraftment was 10 (range 5–14 days) and platelets engraftment was 15 (range 8–45 days). The cryopreserved products were stored at −80°C for median 7 days (range 2-41 day) before transplant. Discussion/Conclusion: Our analysis shows that PBSC can be successfully cryopreserved with mechanical uncontrolled rate freezing. This is a cheap and simple method to freeze the stem cells for a short period in resource-constrained setting. Aim: The study intended to estimate the intra- and inter-model reliability and agreement between the HemoCue Models 201+ and 301 in a blood bank donor screening setting. Materials and Methods: Venous blood samples from 115 blood donors were analyzed by two Hemocue 201+ instruments and two HemoCue 301 instruments. The Lin's concordance correlation coefficient (CCC) as well as the Bland–Altman limits of agreement was measured. Results: The 95% lower confidence interval (CI) of all the CCCs had a value >0.90. The CCC between instruments belonging to the same model was compared to instruments belonging to different models. 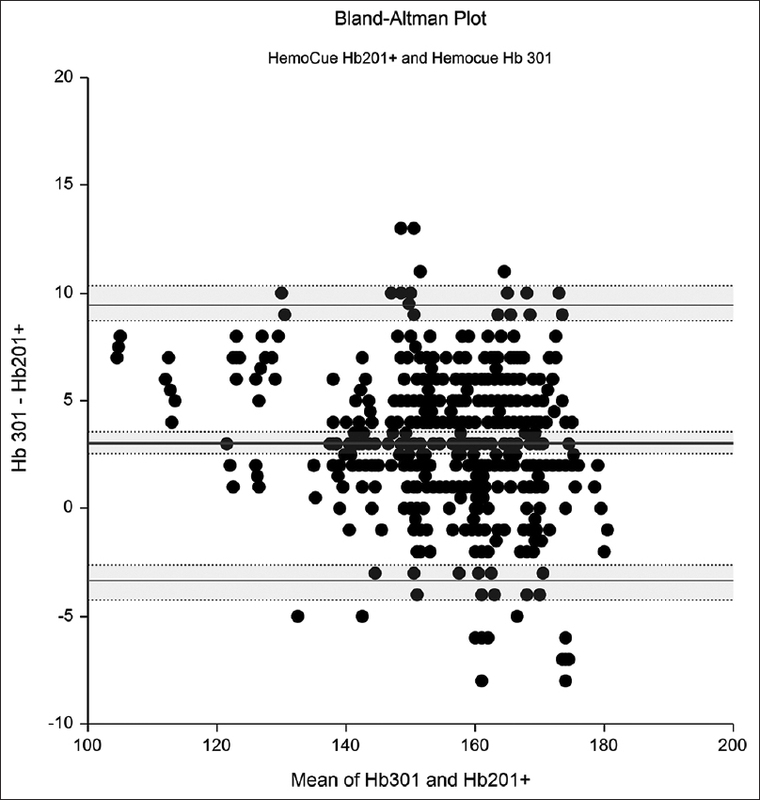 The mean of HemoCue 301 was higher than HemoCue 201+ by 3.04 g/L with the 95% CI of the differences (i.e., the limits of agreement) between the two models ranging from −3.35 to 9.44 g/L. The bias between two instruments was lesser, and the limits of agreement were even narrower between instruments belonging to the same model. Conclusion: The inter-instrument reliability and agreement are satisfactory in a blood bank setting. Introduction: Outcome data in pediatric plasma exchange, especially in nonrenal indications are scarce. We aimed to evaluate its role and outcome in our patients. Subjects and Methods: A retrospective study of children admitted in the year 2016 to the Pediatric Intensive Care Unit requiring plasma exchange for nonrenal indications was undertaken. Plasma exchange was given as adjunctive therapy along with primary treatment for the disease concerned. Demographic and clinical data were studied, and descriptive statistical analysis was carried out. 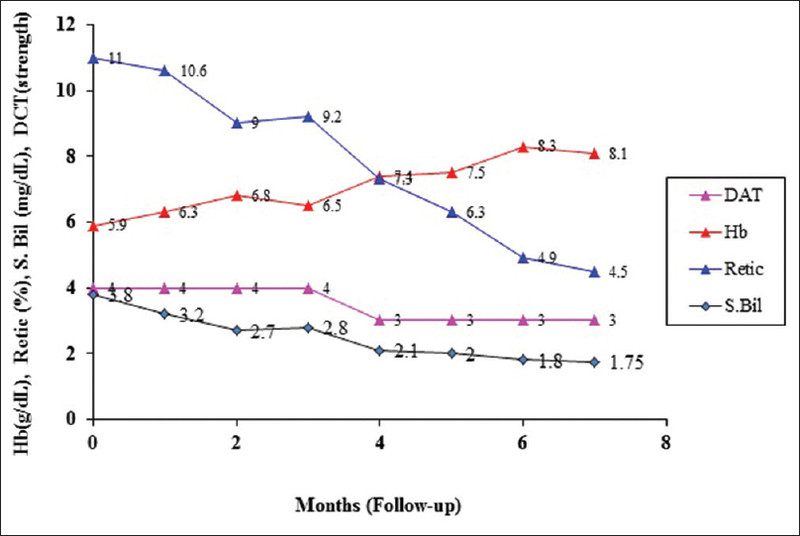 Results: Ten children underwent plasma exchange during this 1-year period with a male: female ratio of 3:2 and a mean age of 10 years (range 3–16 years). 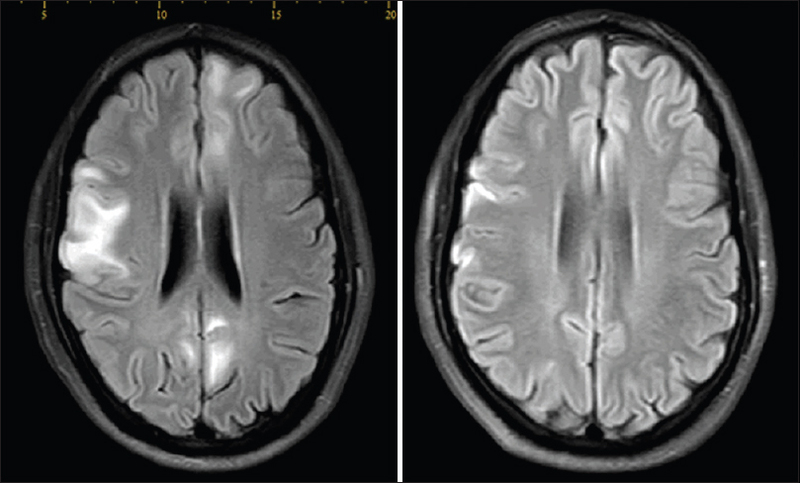 The indications were acute disseminated encephalomyelitis (n = 2), acute neuromyelitis optica (n = 1), catastrophic antiphospholipid antibody syndrome secondary to systemic lupus erythematosus (SLE) (n = 1), severe SLE with cerebritis/hemophagocytic lymphohistiocytosis (HLH) (n = 2), severe dengue sepsis with HLH/multi-organ dysfunction syndrome (n = 2), and thrombotic microangiopathy secondary to snake bite envenomation (n = 2). All received either 1.5 or 2 times plasma volume exchange (mean sessions – 4, range = 1–6). The mean duration of stay in hospital was 17.2 days (range = 3–40 days), and follow-up was 78 days (range = 3–180 days), with the majority of children (8/10, 80%) survived from the catastrophic illness at the time of discharge. Two children (2/10, 20%) succumbed due to the disease per se in severe dengue sepsis in one and enterobacteriaceae sepsis (hospital-acquired pneumonia) in another. Conclusion: Plasma exchange was found to be beneficial as complementary therapy in a critical care setting, especially for nonrenal indications. Background: Platelet additive solutions (PAS) are crystalloid nutrient media used in place of plasma for platelet storage. They replace 60%–70% of plasma in platelet components, so the amount of storage plasma can be decreased. Platelets in PAS have lower risk for allergic transfusion reactions with equivalent clinical efficacy for controlling bleeding. Aim: The aim of this study is to evaluate the clinical and laboratory efficacy of PAS-platelets. Materials and Methods: A total of 1674 single donor platelet (SDP) were collected in PAS in the month of June to September 2016 by different apheresis systems. The quality control tests were done on 356 units in 4 months. Total number of SDP were processed with Amicus device (n = 232), Trima Accel (n = 84), and MCS+ (n = 40). The parameters analyzed were antibody titer of anti-A and anti-B, volume, platelet count, pH, bacterial contamination, and reporting of adverse transfusion reaction. Antibody titers were checked by tube technique, and platelet counts were checked by hematology analyzer Sysmex poch 100i. The swirling was checked manually, and pH was checked with pH strips. Results: Out of 356, 164 units were O group, 113 units were B group, 68 units were of A group, and the remaining 11 units were of AB Group. Anti-A and anti-B titer was significantly reduced in PAS-SDP and found 1:32 or less for all the units. All the units found negative for bacterial contamination. No transfusion reaction was reported of the units transfused. All other quality parameters for platelets also found satisfactory after implementing the additive solution. Conclusion: The ABO antibody titers were significantly reduced after addition of PAS. This facilitates the ABO incompatible SDP transfusion and helps in inventory management. The risk of allergic transfusion reaction decreases after reducing the amount of plasma from SDP units. Using PAS-SDP certainly improve the inventory management for platelets with no compromise on clinical and laboratory efficacy. 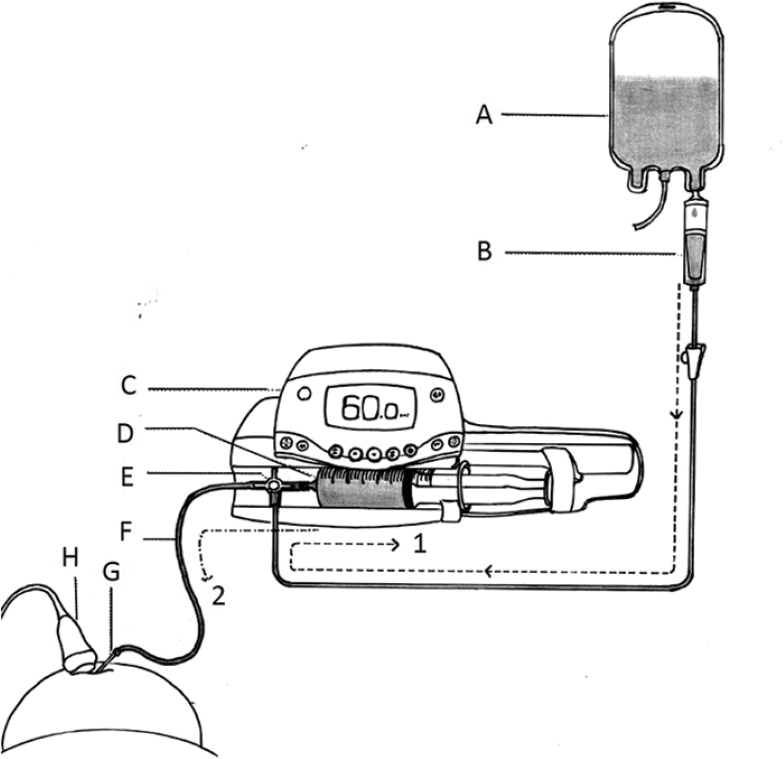 Background: Auditing and education are the tools for improvement in the transfusion practices. Clinicians are not providing patient's demographic data and medical history to the blood bank that required transfusion. This missing information in blood request forms can lead to transfusion reactions to the patient. So we planned to analyse the blood request forms received at our blood bank and the impact of educational program for the clinicians. Methods: A total of 6894 blood request forms were received from the month of July 2014 to December 2014 at a blood bank in Amritsar, India. We evaluated for completeness of the blood request form in parameter columns like second identification (CR No. or Father/Husband Name), diagnosis, pre transfusion hematological parameters, quality and quantity of blood component required, history of previous transfusion and adverse transfusion reaction, urgency of transfusion, medical officer name and signature, phlebotomist name and signature etc. A series of CMEs on “Safe Transfusion Practices” were organized for clinicians and hospital staff from 1st August 2014 and improvement in clinicians' behavior was analysed. Results: A total of 60.83% requests were not filled completely during the study period. Of these 91.42% were in the month of July, which decreased to 48.76% in the month of December 2014 with a total improvement of 42.66%. Incomplete second identification (91.03%) and history of previous transfusion and adverse transfusion reactions (80.21%) were the commonest incomplete fields in the month of July 2014. 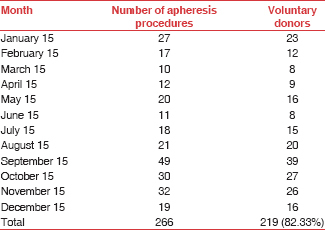 In the month of December 2014, an improvement in incomplete second identification was observed (12.8%) however phlebotomist signature was still a major incomplete field (45.19%). A statistically significant (p value = 0.004, paired 't' test) improvement in completeness of forms was observed. Summary: Results of medical audit and using those as a basis for developing a highly targeted educational program, can improve the clinicians' approch towards transfusion practices. Background: Blood transfusion of contaminated components is a potential source of sepsis by a wide range of known and unknown pathogens. Collection mechanism and storage conditions of platelets make them vulnerable for bacterial contamination. Several interventions aim to reduce the transfusion of contaminated platelet units; however, data suggest that contaminated platelet transfusion remains very common. Aim: A pathogen inactivation system, “INTERCEPT”, to inactivate bacteria in deliberately contaminated platelet units was implemented and evaluated. Materials and Methods: Five single-donor platelets (SDP) and five random donor platelets (RDP) were prepared after prior consent of donors. 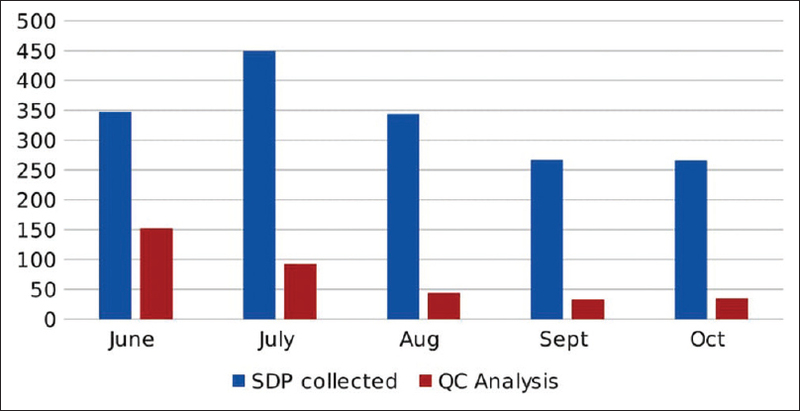 Both SDP and RDP units were deliberately contaminated by stable stock ATCC Staphylococcus aureus and Escherichia coli, respectively, with a known concentration of stock culture. Control samples were taken from the infected units and bacterial concentrations were quantified. The units were treated for pathogen inactivation with the INTERCEPT (Cerus Corporation, Concord, CA) Blood system for platelets (Amotosalen/UVA), as per the manufacturer's instructions for use. Post illumination, test samples were analyzed for any bacterial growth. Results: Post-illumination test samples did not result in any bacterial growth. A complete reduction of >6 log10S. aureus in SDP units and >6 log10Escherichia coli in RDP units was achieved. Conclusion: The INTERCEPT system has been shown to be very effective in our study for bacterial inactivation. Implementation of INTERCEPT may be used as a mitigation against any potential bacterial contamination in platelet components. Hypertriglyceridemia (HTG) is the third most significant risk factor for acute pancreatitis after gallstones and alcohol. Therapeutic plasma exchange (TPE) has been considered a possible treatment for HTG-induced pancreatitis, especially in severe and refractory cases. Here, we report one such clinical experience with a patient of severe HTG-induced pancreatitis. He was treated with TPE along with intravenous insulin, statins, and fibrates. TPE resulted in immediate relief of symptoms as well as a marked improvement in laboratory values, with 74.5% reduction in triglycerides after a single session. TPE can be successfully utilized as an adjunct in HTG-induced pancreatitis. Sickle cell-beta thalassemia is a double heterozygous state. Red cell exchange (RCE) transfusion reduces the concentration of sickle cells without increasing the hematocrit or whole-blood viscosity. It can be performed manually or by erythrocytapheresis. RCE transfusion is an effective tool for both acute and chronic complications of sickle cell disease. In patients unaffording erythrocytapheresis, even manual RCE can give favorable results. A 37-year-old male, a known case of sickle cell-beta+ thalassemia (βsβ+), presented with avascular necrosis of right femur and humeral head. He was posted for the right hip arthroplasty and shoulder hemiarthroplasty. Successful manual RCE transfusions were done. The hemoglobin S levels decreased postmanual RCE procedures, and the patient was operated successfully. Transplant recipients are always at a risk of developing anti-human leukocyte antigen (HLA) antibodies due to prior sensitizing events such as blood transfusions, multiple pregnancies, or transplantation. Unexpected positive outcomes can be seen in complement dependent cytotoxicity (CDC) based assays due to underlying autoimmune disorders or pharmacological treatment (rituximab/intravenous immunoglobulin/anti-thymocyte globulin administration), therefore, limiting its value. CDC based assay results strongly depend on the vitality of the donor lymphocytes, highlighting another major limitation of this assay. Thus, as an alternative approach, solid phase based crossmatch assays were introduced which function independently of the cell quality and have higher sensitivity and specificity in detecting anti-HLA antibodies. 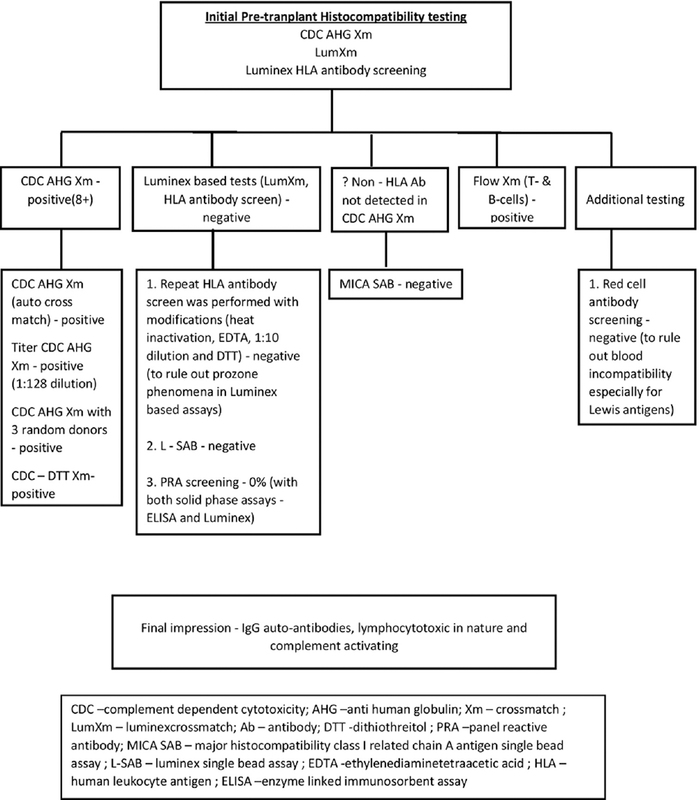 We describe a case where the patient awaiting renal transplantation from living related donor was evaluated by pretransplant histocompatibility testing for the detection of anti-HLA antibodies. The histocompatibility testing revealed positive CDC anti-human globulin and flow crossmatch along with negative Luminex based assays (HLA antibody screen, luminex crossmatch, and luminex single bead assay). Detailed histocompatibility workup revealed immunoglobulin G autoantibodies which were complement activating and lympocytoxic in nature. World Health Organization (WHO) recommends screening of syphilis in low prevalence populations of blood donors by treponemal tests like enzyme-linked immunosorbent assay (ELISA), whereas in India screening is done by rapid plasma reagin (RPR). The present pilot study evaluated the performance of ELISA compared to RPR, keeping Treponema pallidum hemagglutination assay as a reference test. ELISA was equally sensitive (100%), more specific (56.3% vs. 0%), more accurate (83.7% vs. 62.7%), had better positive predictive value (79.4% vs. 62.8%) and negative predictive value (100% vs. 0%), and less biological false positivity (37.2% vs. 20.6%) when compared to RPR. The WHO recommendations of screening for syphilis in low prevalence population of blood donors using ELISA may be adopted for usage in transfusion services that have the facility of ELISA. Detection of nonspecific antibodies unrelated to blood group antigen that causes nuisance in pretransfusion testing is a rare event. Their interpretation is often made only after the exclusion of all possible clinically significant antibodies and results in the unnecessary expenditure of reagents and human resources. We report one such nuisance antibody detected in an antenatal female that showed pan reaction with antibody screening and identification panel red cells including auto control but was compatible with group-specific donor units. Direct antiglobulin test was positive with no hematological evidence of bleeding. Repeat antibody screening test performed after washing the panel red cells and use of panel cells from different manufacturer showed negative reaction raising the suspicion of antibody specificity against chemical constituents in suspension medium of panel cells. Interpretation of nonspecific antibodies as to what they really are demands extensive immunohematological work-up and causes a delay in issue of blood components to the recipient. In half of the suspected autoimmune encephalitis (AIE) patients, no antibodies are identified despite extensive investigation. Therapeutic plasma exchange (TPE) is a potential first-line therapy for various subtypes of AIE. Here, we present a case of autoantibody-negative-suspected AIE, managed successfully with TPE after patient showed no response to steroids. A total of 5 sessions of TPE was done. One standard TPE procedure session was 1.2–1.5 plasma volume exchanges using 5% albumin as a replacement fluid. After five sessions, patient's clinical condition improved significantly, and a repeated magnetic resonance imaging after 5th cycle of TPE revealed a reduction in the areas of signal alteration. This was suggestive of regression of disease. Patient was discharged on 10th day of hospital admission. With early suspicion even in the absence of detectable autoantibodies, TPE plays an important role in the management of encephalitis. ABO incompatibility and other alloantibodies have emerged as a significant cause of hemolytic disease of fetus and newborn (HDFN), leading to neonatal morbidity and mortality. We report three cases of severe ABO-HDFN where blood exchange transfusions (ETs) were required in neonates with hyperbilirubinemia. 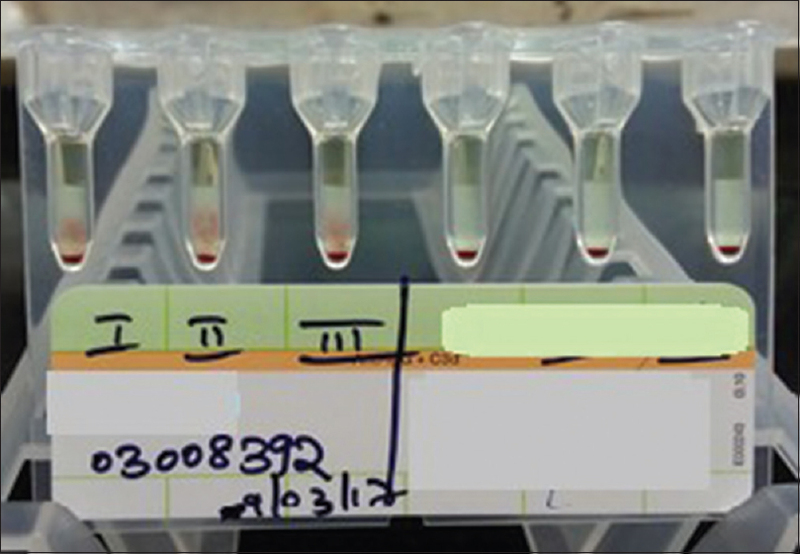 Blood grouping (ABO/RhD) was performed using conventional tube technique. The antibody screen was done using commercial three-cell panel (Bio-Rad ID-Diacell-I-II-III, Switzerland) by gel technique. Direct antiglobulin test (DAT) on neonatal sample and compatibility testing were also done by gel technique. Elution on DAT-positive sample was performed using “heat elution” method. All the three neonates were A RhD positive and were born to O RhD-positive mothers who were negative for antibody screen. Their DAT was positive (2+) and the elution of neonatal red cells yielded a positive reaction with A cells which was suggestive of anti-A antibody. The maternal anti-A (immunoglobulin G) antibody titers were high: 512 and 1024 (in two cases). The total serum bilirubin (mg/dl) of the three neonates was 22, 27, and 25 which came down significantly after they received ETs. Severe ABO-HDFN may occur in neonates born to mother with high titer ABO antibodies which can be effectively managed with ET. The blood specimen of a 30-year-old male donor showing a discrepancy in cell and serum grouping was targeted for detailed study at the blood bank at tertiary care hospital in South Gujarat. Forward grouping showed group as “O” RhD positive and reverse grouping as group “A.” Further testing confirmed that the individual's blood group was para-Bombay A (para-AH). Family members were screened, and younger brother was also identified as para-Bombay phenotype. The para-Bombay phenotype is very rare, and only a few cases have been reported from India. This blood group is characterized by the absence of ABH antigens on red blood cells (RBC's) with the presence of ABH substances in body secretions or by the weak expression of ABH antigens on RBC's with the absence or presence of substances in body secretions. This rare phenotype can be mislabeled as “O” if all detailed investigations are not performed.